Certain certifications and specialized training can be beneficial to help you further your career, and truck driving school in Phoenix is a great way to get the certifications that you need in order to find a higher paying job. Going through the effort to attend truck driving school is the process that you need to follow in order to get your CDL drivers license, and then you will be ready to find a truck driving job. Even though it is a bit of an investment in both time and money, it is worth the effort to go through the CDL training. Once you have your license, you are able to work specific jobs that you weren’t previously qualified for. One of the advantages is that you can find a school in your local area, so that you can do your training close to home. For example, if you live in Tucson, Arizona, then you should look for a truck driving school in the city or surrounding areas. After you have finished your CDL school, you will have the qualifications and connections that you need in order to find a job. If you are having a hard time finding a job right now, then getting your CDL might be the determining factor to help you land a job in the near future. There are companies hiring CDL drivers, but keep in mind that not all companies are created equal. A large company can be nice to work for because of the extra benefits that are available, although most drivers comment about the fact that they feel like a “number” in the company. 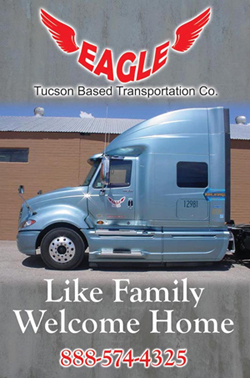 Here at Eagle Transportation, our goal is to provide you with the benefits of working for a large company, but we strive to have a personal connection with each of our drivers. Contact us today to learn more about the jobs that are available.